Another unannounced device has just popped up on GFXBench's online database, and this time it's Microsoft's Surface 2 tablet. There are only two results on the database. One is for the T-Rex HD Offscreen test, which gets a score of 10.6 fps. 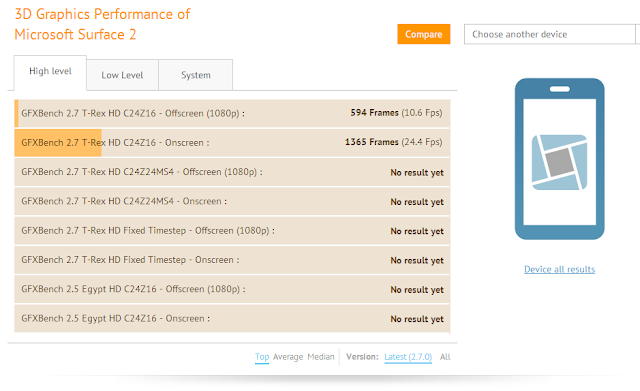 I certainly hope the performance is being affected by unfinished software, because this score is mediocre compared to other Tegra 4 devices. For comparison, the iPad 4 scores 19.1 fps on the same test, and it's 10 months old! The other benchmark score is for the Onscreen T-Rex HD test, and that gets a score of 24.4 fps, which is considerably above the iPad 4's 12.7 fps score, but that's just because of the Surface 2's mediocre resolution. Take this all with a grain of salt, of course, but if this is really the Surface 2 I can almost guarantee it'll be another flop. 1360 x 768 resolution for a 10.6-inch display (the size of the last-gen Surface, and most probably the Surface 2 too) was acceptable for a high-end device in 2011, but not today. And unless these benchmark scores are justified by unfinished software, then the Surface 2 will be far behind in terms of performance, even compared to other devices powered by the very same SoC. 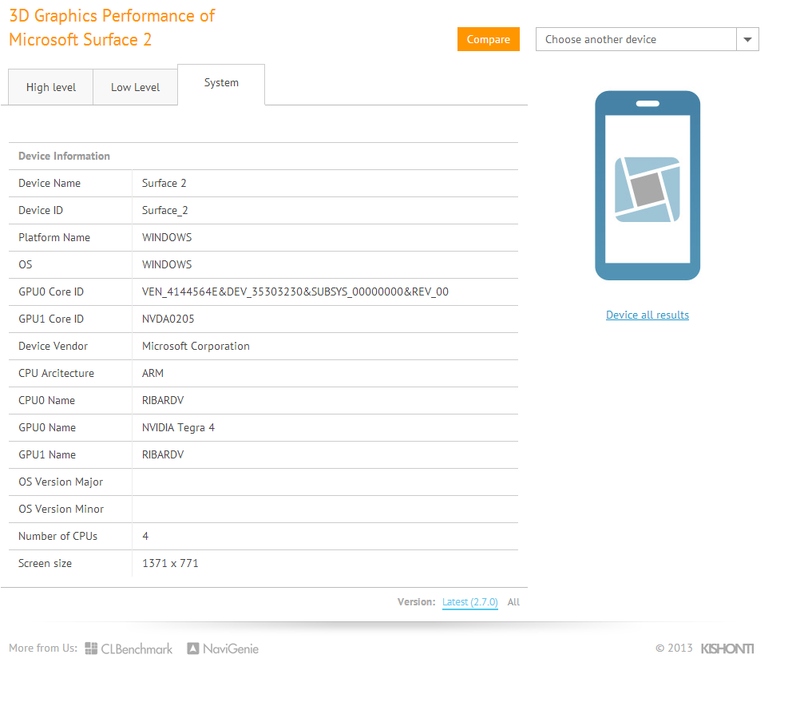 Update: The Surface 2 has been officially announced, and the resolution of the device, unlike what the benchmark leak reports, is 1920 x 1080. Also, the Tegra 4 SoC is now officially confirmed, though clocked at a lower 1.7GHz.